What will Next Year’s Top Kitchen Design Trends Be?! Bottom Line: Who cares? See that orange formica countered kitchen over there? It was designed in 1964 by one of this nation’s top designers, Frank Lloyd Wright. At the time it was the Height of Fashion. 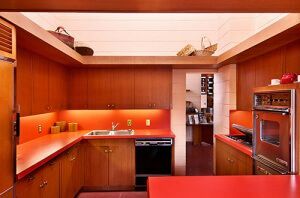 Anyone who bought orange countertops because everyone else did / because a top architect used it and not because they loved it soon came to hate their kitchen. Bloggers are usually SEO traffic drivers, marketers and sometimes craftsmen that have found time to write. Even the best ones can only look at what people bought this year and at next year’s catalogs. Even if you could know for sure what the fad will be, why buy what other people are tending to buy more of? Here at I&E we see a lot of sleek contemporary kitchens getting more and more popular each year. I myself love them simply because I’m getting older and they are SO easy to clean! All those straight no dust and grease catching surfaces, YES! I ooo and aww when I see a really well done one. But…. do you like contemporary kitchens? Do you love them? Get what YOU like. You need a look you will love for decades. That is going to be worth the money you invest into it. ‘Cause let’s face it, we all know that a total remodel into your dream kitchen isn’t going to a super cheap and quick enterprise you will repeat every year. Be brave, be bold, be You. Next year’s top kitchen design trends will be outdated in 5 years but your taste will still be in style with you. Even if the design isn’t outdated, do you really want to be stuck with a spanish tiled backsplash just because it is “in” right now if you don’t like bright spanish tiles? 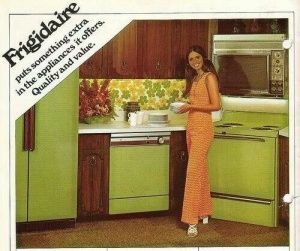 Let’s put it like this: you remember all those avocado green appliances or the dirt brown ones from the 70s? Well, if you are old enough you do and if not, then… back some time ago, long, long ago they were in style. And then they were not but some people were stuck with them, along with orange formica countertops and houses full of shag carpet. One friend of mine (bless their heart) even had glitter mixed into their ceiling popcorn. The 60’s and 70’s were so much fun! For everybody that really liked those choices things were peachy, but for everyone following a fad (or wanting to sell the house after the 80’s), it was not happy times. Maybe you think Stainless Steel Appliances are IN but you don’t actually Really adore them. Why spend extra on stainless steel if you don’t get extra enjoyment out of it? Next year’s top kitchen design trends don’t mean anything. Neither do the year after the next year’s top kitchen design trends. What matters is your long term happiness in the investment you make. Call I&E for remodeling in Southern Cali. Or contact us so we can help you design the kitchen you love, we will custom make and ship to you the cabinets you want. All you’ll need to do is find an installer!